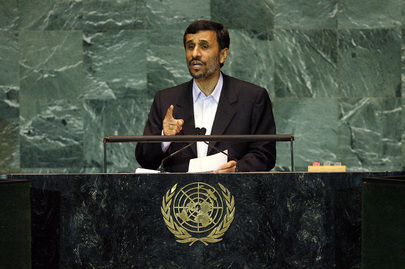 MAHMOUD AHMADINEJAD, President of Iran, said that to create "a bright tomorrow", fundamental changes of attitude would have to be made. First off, the current financial system would have to change. "The engine of unbridled capitalism, with its unfair system of thought, has reached the end of the road and is unable to move," he said. "The era of capitalist thinking [.] and the age of setting up empires is over. It is no longer possible to humiliate nations and impose double standards on the world community." Such hypocrisy would not be allowed to continue. "Those who define democracy and freedom and set standards while they themselves are the first who violate fundamental principles [.] can no longer be both the judge and executor, and challenge the real democratically established Governments." He added that "most nations, including the people of the United States, are waiting for real and profound changes." With regard to Palestine, he said that the entire population of a country had been deprived of their homeland for more than 60 years, and their legitimate right of self-defence had been denied. He noted that while certain Governments unconditionally supported the occupiers against defenceless women and children, at the same time, "oppressed men and women" were subjected to heavy economic blockades, the result of which was "genocide". He then addressed issues in the wider Middle East and said it was "not acceptable that some who are several thousand kilometres away from the Middle East should send their troops for military intervention" and spread war, bloodshed, aggression and terror. It was no longer possible to bring a country under military occupation in the name of the fight against terrorism and drug trafficking, while the production of drugs multiplied and terrorism widened its dimensions, he said. And "those who have created the current disastrous situation continue to blame others. How can you speak about friendship and solidarity with other nations while you expand your military bases in different parts of the world, including in Latin America?" He warned that such "militaristic logic" would have dire consequences and exacerbate the problems in the world. "There are those who export billions of dollars of arms every year, stockpile chemical and biological, as well as nuclear weapons [.] while accusing others of militarism." On the subject of the economy, he said the current financial mechanisms were outdated, and those inequitable structures were unable to solve the challenges ahead. The political and economic structures created following the Second World War had been based on intentions to dominate the world and failed to promote justice and lasting security. "By the grace of God, Marxism is gone. It is now history. Unhindered capitalism will certainly have the same fate." He spoke against colonialist and discriminatory goals and hypocrisy in international relations, and called for collective action "to return to basic moral and human values". Before the Assembly were several points on the agenda, he said. The first included the reform of the Organization itself, in particular the structure of the Security Council and the abolishment of veto rights, and the restoration of the rights of the Palestinian people. He also called for an end to inference in Iraq, Afghanistan, the Middle East, Africa, Latin America, Asia and Europe. "Oppression against Palestinians and violations of their rights still continue," he said. "Bombings in Afghanistan and Pakistan have not yet stopped, and Guantanamo prison has not yet been shut down. And there are still secret prisons in Europe." Further points before the Assembly included reform of the current international economic structures and political relations, and the "eradication of the arms race and the elimination of all nuclear, chemical and biological weapons". At the same time, he emphasized the right of "all nations to have access to peaceful technologies". Speaking of his own country, he said: "Our nation has successfully gone through a glorious and fully democratic election, opening a new chapter for our country in the march towards national progress and enhanced international interactions. They entrusted me once more with a large majority with this heavy responsibility." He emphasized that Iran was ready to engage with the international community and "warmly shake all those hands which are honestly extended to us", he said. "No nation can claim to be free from the need to change and reform in this journey towards perfectness. We welcome real and humane changes, and stand ready to actively engage in fundamental global reforms."